Research shows the average person utilizes only 20-25% of their existing potential. Small increases in the use of untapped potential can deliver significant results with multiplying effects. An organization can transform its results simply by developing its people. A leadership development program increases effectiveness for the management process, enhances productivity, and builds a results-based leadership culture. At LMI, we take pride in offering long-term leadership development options which allow for the refinement of more successful habits and behaviors leading to success. Participants experience accountability from several sources, including Facilitator, Coach, Supervisor, Mentor, and Group of Peers. These different sources of accountability, coupled with a long-term process, produces positive changes in attitudes and behaviors. These changes translate into increased productivity, results, and a better equipped workforce. 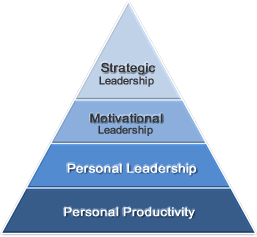 Strategic leadership is the ability to lead an organization. A strategic leader is able to define and develop the purpose of the organization, the key strategies, the optimum structure, the right people in the right roles, and the most effective processes for the organization to succeed. Every organization needs good management. Dynamic managers excel in people skills and the ability to create a motivational environment. Effective managers make good decisions at the right time and then take action. Most managers and supervisors lack the leadership and supervisory skills necessary to fulfill their positions. For example, failing to delegate, many find themselves working long hours and fighting burn-out. As the world of business has changed and evolved, the need for effective leaders has skyrocketed. For businesses to become truly empowered and innovative enterprises, they must develop motivational leaders throughout the entire organization. Productivity is the wellspring of success and a basic part of human nature, yet many lack the direction they need to achieve greater results. Miscommunication can cost businesses and industries millions of dollars each year. Becoming an effective communicator can be learned. It takes understanding of human behavior and communication styles. Effective communication is a dynamic process that offers long-term dividends for the life of your company. There is no better time to focus on women and the remarkable strides they have made in the last century and continue to make. The 21st century does indeed belong to women! Women will make more progress using their full potential in the next 50 years than they have in the last 500. When a team works effectively and efficiently, everyone wins. A successful team is truly an example of synergy at work – that is, accomplishing more as a team then individuals could by working alone. Successful salespeople are self-motivated, focused, and have crystallized goals. They enjoy interacting with people and understand the importance of the desire to be of service. In addition, they know the “basics” of professional selling. LMI’s development programs are built to encourage personal growth and a higher level of behavioral change. However, because people desire continued accountability after the end of a development program, individuals often inquire about the possibility of a continued coaching relationship. While all of the above challenges may be addressed through a personal or executive level development process, we understand that sometimes it works better for individual scheduling reasons to engage in monthly coaching rather than weekly or bi-weekly development sessions. The coaching process focuses on “what matters most” to the participant. By assessing each individual’s needs and learning habits and behaviors, we focus our joint attention on “High Payoff Activities” to improve performance and results. We introduce time tested tools and techniques to create a positive ROI and help you achieve your desired level of success. Most organizations understand that effective management and deployment of assets can mean the difference between success and failure. But many organizations fail to consider their most critical assets — human capital. A recent study by McKinsey & Company revealed that “A” performers tend to be 50-100% more productive than “C” performers. Clearly, identifying those with the potential for “A” performance can enhance an organizations performance. So, how does an employer identify outstanding potential, and once identified, how does an employer retain and continue to development that potential? Testing and Survey tools have long been an effective, yet underutilized, tool to help employers make the most of their human capital. As part of our Strategic Development Process, we offer awareness tools via assessment and survey instruments that enhance performance on three fronts: New Hire Selection, 360° Feedback Surveys, and Cultural & Organizational Needs Surveys. This time management training system increases productivity through effective personal management. To take control of your life: plan and organize effectively, set and achieve goals, and live a balanced life. This workshop consists of executive coaching and facilitation to help your executive team establish specific, measurable goals, foster team collaboration, and develop a robust plan of action to attain these mutually agreed upon goals. This is a full-day goal-setting session, followed by monthly performance reviews to monitor activity and assure goals will be reached by specific target dates. This goal setting workshop introduces participants to the fundamentals of goal setting, developing a robust plan of action identifying key steps for successful implementation, and tracking and measuring success. Looking for a powerful keynote speaker for your next event? The Leadership Management Institute is able to provide you with leading-edge speakers who are business visionaries with in-depth industry expertise.